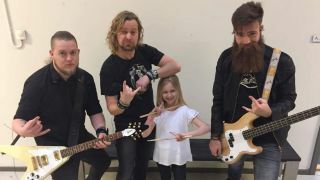 Earlier this month we brought you news that 10-year-old Johanne Astrid won this year’s edition of Denmark’s Got Talent with her kickass drumming. That’s right, she’s not old enough to buy a copy of Viz but can jam like an absolute demon (we’re not jealous, honest). Why did you want learn the drums? Why do you love rock music? How did you get involved with joining the band The Mofos? Why should kids learn instruments? Why did you go on Denmark’s Got Talent? Did you ever think you would win? How has your life changed since you won? What does the future hold for yourself and your band? “I hope to play with the band for many years and perform for many people. I will continue to practice even more and get some good drummers to teach me. I will also start getting keyboard lessons to understand music better. I love to write songs myself and would like to be able to write down the notes. Follow Johanne’s drum odyssey on Facebook.